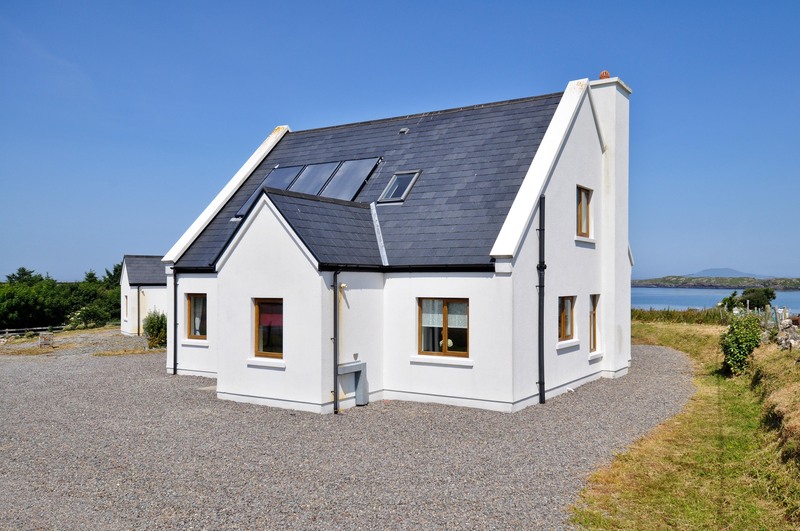 Three beautiful detached lodges for holiday rental beside the shores of the Atlantic Ocean and on the grounds of Renvyle House Hotel & Resort. The lodges enjoy a tranquil setting close to the hotel and all its services, with views on to the sea and are situated on the Wild Atlantic Way. The holiday lodges at Renvyle House are located within an easy stroll of the main hotel building yet in a quiet and secluded setting. The lodges are detached and provide quality, spacious and bright accommodation. They comprise of four bedrooms (2 double rooms, 1 twin room and 1 single room), two bathrooms, a sitting room and kitchen. Each house benefits from under floor central heating, double glazed windows and an open fireplace in the sitting room. Holiday residents of the lodges are entitled to use the recreational facilities of the hotel free of charge, which include developed gardens, wild walks, sandy beaches, a large well stocked fresh water lake, tennis courts, outdoor heated pool (summer months). It also has an award winning restaurant and a bar.